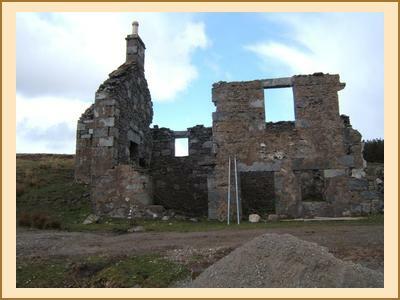 Northerly winds and an unseasonable artic blast greeted us in the North West for the May Bank Holiday Weekend at Sail Mhor Croft in Dundonnel. Only 9 of us made the trip north on Friday evening with Mike & Fiona coming south on Saturday via a trip up Ben Hee after having a week in Scourie. Saturday saw various activities undertaken. Alan R braved the cold and embarked on a lengthy cycle down to Shieldaig followed by the Applecross circuit with Anne acting as his domestique and providing him with lunch and the all important transport to get back. Fiona C headed for Beinn Gholach and enjoyed a blizzard on the summit, as did Chris on Am Faochaig & Cona Mheall. Harry headed to Seana Braigh.Kenny, Alison, Martin & myself had a days climbing at Loch Tollaidh. A few graupel showers and cold hands but great climbing in a fantastic location nonetheless. Sunday saw a brighter & more importantly sunny day. Chirs had his bagging head on and headed to the fannaichs for a circuit of 5 munros, Harry bagged Beinn Alligin and Fiona C did creag Rainich at the easterly end of the Fannaichs. 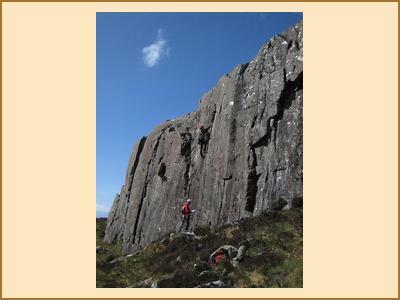 The remainder had a sociable days climbing at Raven crag, Fruity Crag & Druid Rock south of Gairloch. A chilly start but soon we were basking in the sun with great views to Torridon. Anne & Alan were the only ones to venture north and they did the various tops on Quinag. More of the same on bank holiday monday with Chris cleaning up in the Fannaichs although he did suffer a jaw injury caused by the size of his sandwich! Fiona C bagged sail mhor and Mike & Fiona headed for Stone Valley for some cragging including an ascent of the classic Bald Eagle. Alan & Anne did a coastal walk and the rest of us continued the cragging with a visit to Badrallach crag. Lovely sandstone routes but a very chilly location. All in all a great trip in a great location, reckon we'll be back soon.